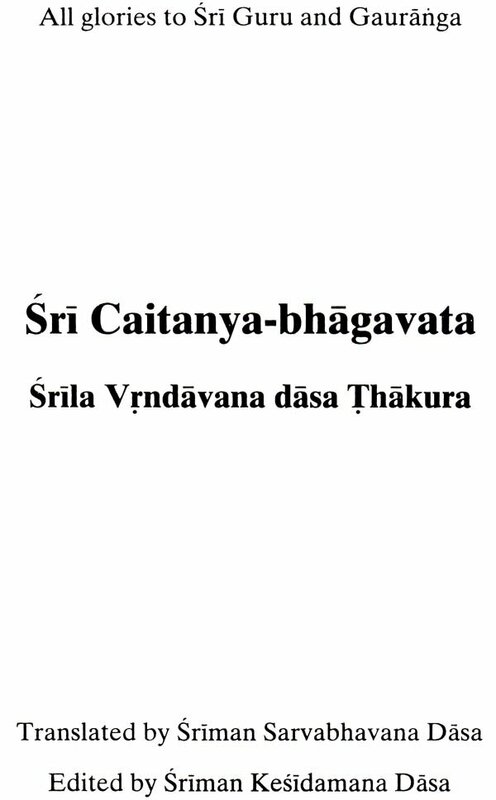 The Sri Caitanya Bhagavata of Srila Vrndavana dasa Thakura is a central work of Gaudiya Vaisnavism wherein the life and teachings of Sri Krsna Caitanya Mahaprabhu are recorded. 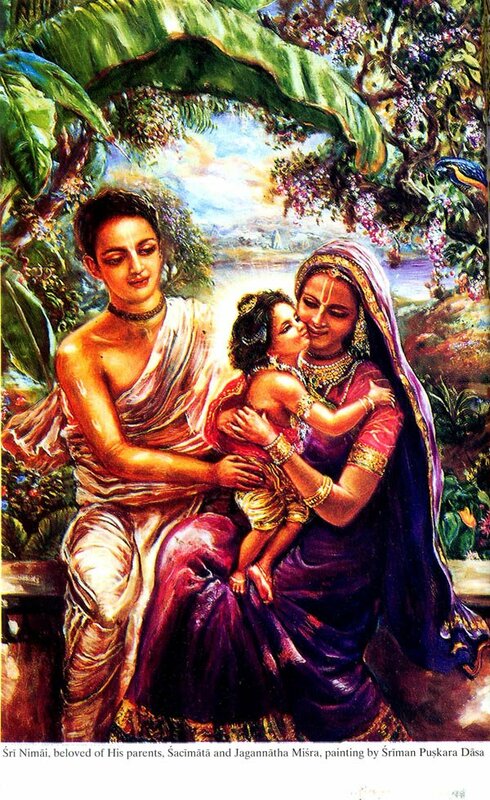 To chronicle the activities of an incarnation of the Supreme Lord, Sri Krsna, demands the greatest of authors and Srila Vrndavana dasa Thakura displays herein the mastery that confirms the sastric statements that he is no less than an incarnation of Srila Vedavyasa, the compiler of the Vedas. 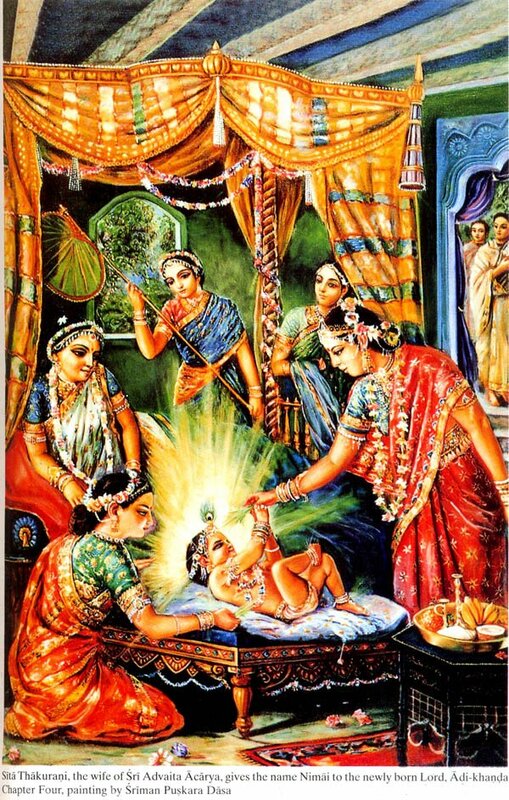 His subject, Sri Krsna Caitanya Mahaprabhu, the Vedas describe as a ‘covered’ incarnation of the Lord, Sri Krsna, in the role of a devotee to teach the religious process applicable for the present age of Kali-yuga, the congregational chanting of the Holy Names of the Supreme Lord, most notably the Hare Krsna Maha Mantra: Hare Krsna Hare Krsna Krsna Krsna Hare Hare Hare Rama Hare Rama Rama Rama Hare Hare. 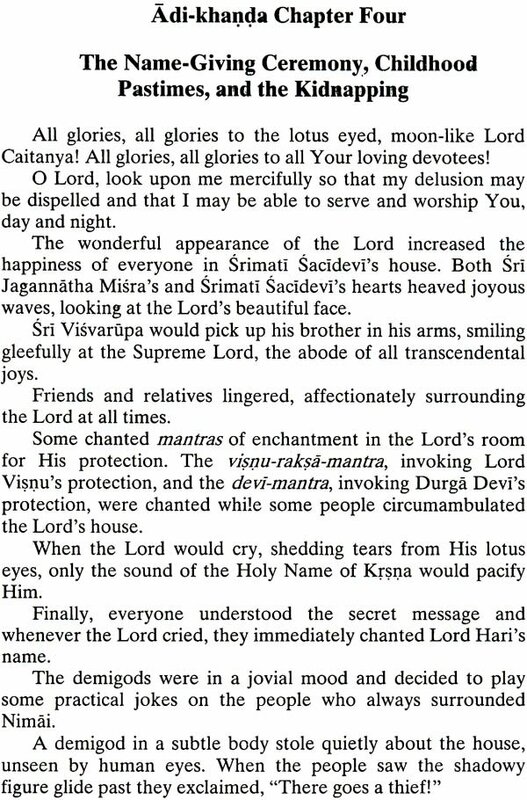 In the pages of this volume, the devoted readers will discover the most wonderful nectarine treasure as the life of Sri Krsna Citanya Mahaprabhu is displayed before the eyes of their soul. They will witness the amazing birth of the Lord, see His childhood, hear his debates as the greatest of panditas, thrill as He starts the sankirtana movement, be present at His ceremony of sannyasa, and live joyfully with the Lord in Jagannatha Puri. All are welcome. The translator, Sriman Sarvabhavana Dasa Adhikari, was born in Calcutta in the year 1948. 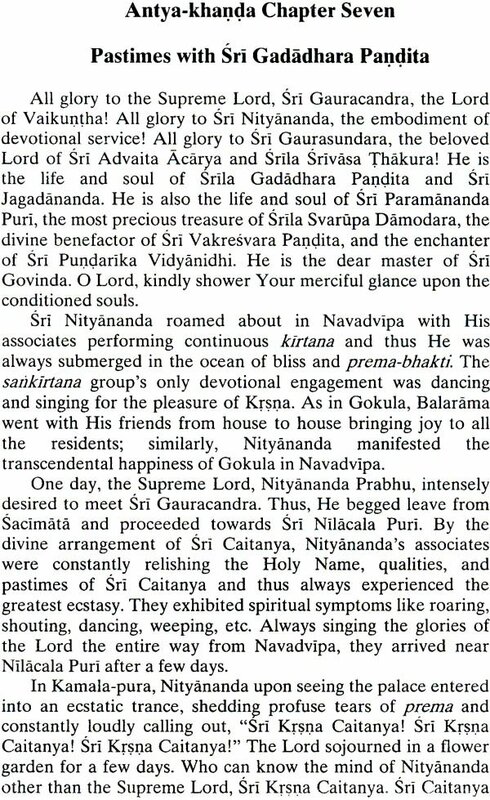 Interested in self-realisation from an early age, he became an initiated disciple of His Divine Grace Om Visnupada Paramahamsa Parivrajakacaya Astottara-sata Sri Srimad Nitya-lila-pravista A.C. Bhaktivedanta Swami Prabhupada the founder-acarya of the International Society for Krsna Consciousness in 1975. A scholar in Sanskrit, Bengali, Hindi, English, and German, his talents and abilities were quickly recognized by Srila Prabhupada who directed Him to translate into English the works of their disciplic succession, the Sri Brahma Madhva Gaudiya Sampradaya. This he has done with distinction, having produced many volumes to date, most notably: Sri Siksastaka, Sri Manah Siksa, Sri-Hari-Nama Cintamani, Sri Dasa-Mula-Tattva, and Sri Jaiva Dharma. 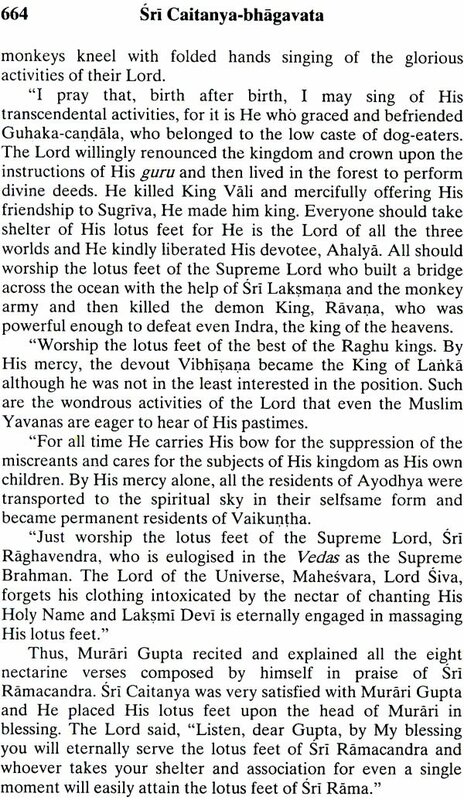 We feel sure the readers will warmly appreciate this present offering, the Sri Caitanya Bhagavata of Srila Vrndavana dasa Thakura. I worship their Lordships Sri Caitanya Mahaprabhu and Sri Nityananda Prabhu, whose long arms extend down to their knees, whose beautiful complexions have the colour and radiance of molten gold and whose elongated eyes are like red lotuses. They have graciously initiated the congregational chanting of the holy names of Lord Krsna. They are the maintainers of the universe, the topmost of the brahmanas, the guardians of religious principles for this age, the munificent benefactors of all living entities, and the most merciful and compassionate incarnations of Godhead.